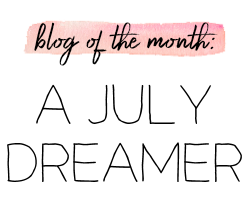 Fashionable Heart: Ice Cream Date! My husband had a team outing at his work on Friday. They decided to do a team-building exercise and went to throw some axes! Isn't that an unique idea? It certainly would not have been first on my mind of things to do! He even hit the bullseye a few times and better yet, he came home in one piece and not several! Since he got home a little earlier than usual, we took the opportunity to go out for an ice cream date. 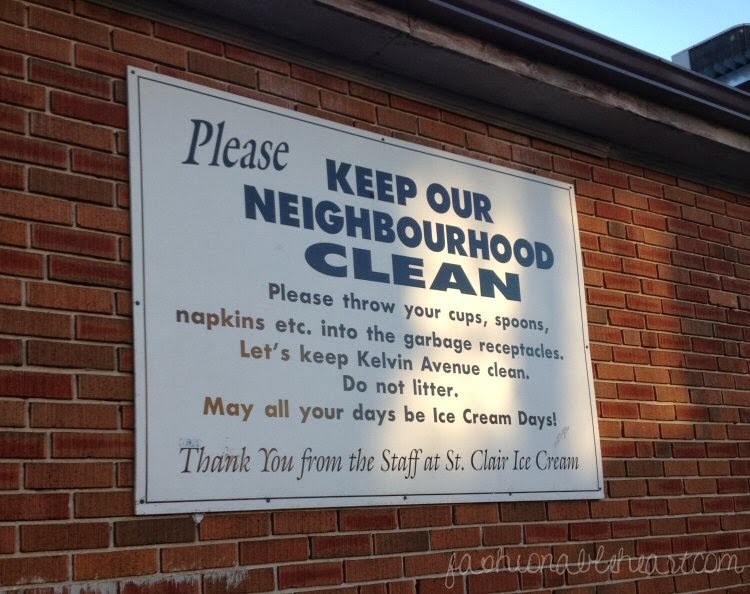 There is a place in Toronto that used to be called St. Clair Ice Cream, but they have since changed the name to Maple Leaf Dairy. 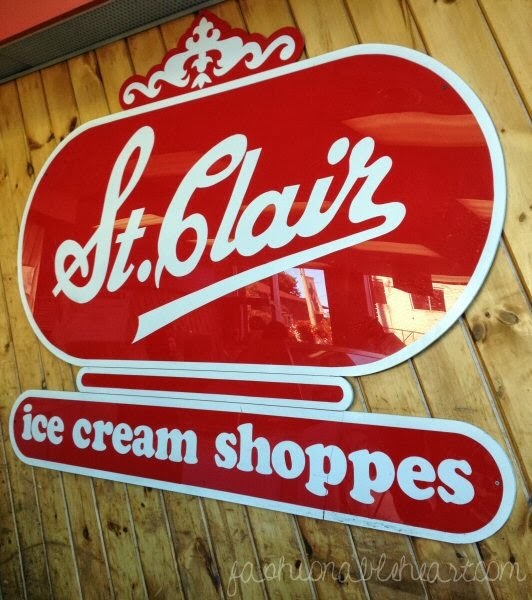 No one really calls it that though, as it will always be St. Clair's to us. They kept all of the original signs, which is a lovely touch! This place is legendary. I'm not kidding. The prices are cheap (bring cash- they do not accept credit or debit) and one of their scoops is like three scoops anywhere else. They do not skimp at all! Plus, they have interesting flavors you may not find elsewhere. My husband's favorite is grape, but they were sold out of it already when we went. Sadly, it is only open during the summer. It closed for the season yesterday, but the factory is next door. And they allow you order from there all year! ^ Being out of grape, my husband chose Strawberry Cheesecake. It was good, but he was not a happy camper about not getting his grape this year. I personally hate the grape. I think it tastes like if you were to chew grape bubble gum while drinking milk. Ha! If you google grape ice cream, one of my pictures is the second to pop up. And of course the site does not credit me in the slightest. 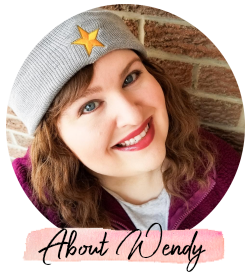 I learned the hard way to watermark my pictures. ^ It's such an old picture now. I was looking forward to finally getting an updated picture. Oh well, there's always next summer! ^ I got Cookies and Cream. It's usually a toss up between this and Chocolate Chip Cookie Dough. I love cookies and milk, so I guess I just gravitate towards cookie-themed ice creams. Makes sense! What's your favorite ice cream flavor? 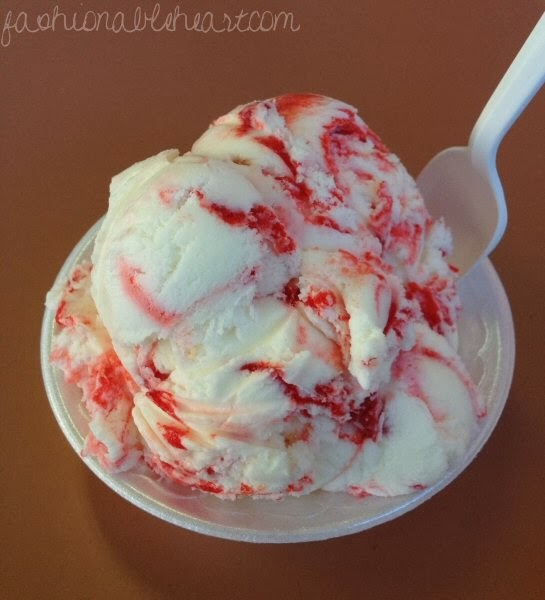 Do you have a local ice cream place that offers unique flavors? I'd love to hear about them! 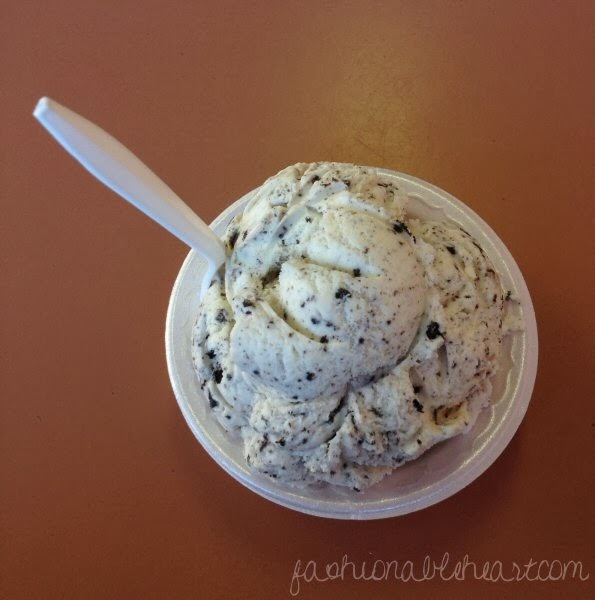 May all you days be Ice Cream Days! I loveeeeee green tea ice cream! Do you not like grapes in general? 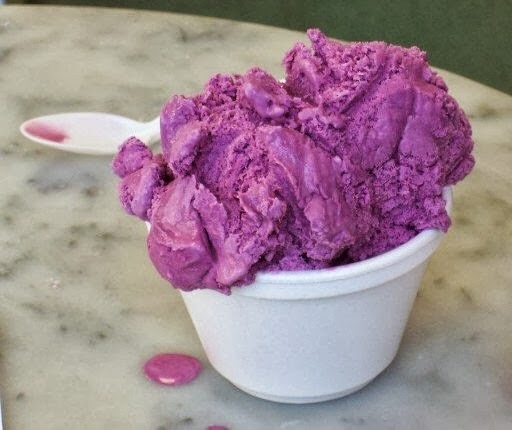 Or do you not just like grape ice cream? :-O I love grape, but I can't eat any grape-flavored anything because they always make everything taste like... medicine. All the ice cream look delicious! @Linh- I love grapes and usually even like grape flavored things, but this is horrible. Haha! Grapes and milk? Just does not appeal to me at all! It's a big thing here, though.